Raiding is all about acquiring items of untold power and riches beyond imagining (and lately: achievements, intangible and annoying as they are). We spend hours drooling over T8, or alternatively, lamenting the looks of our coming wardrobe. In our pursuit for riches and new loot, how many of us stop and spare a thought at the shinies of the past? The coveted armour of yesterday, the holy grail of instances long forgotten? To remedy that, we shall look back, into the deepest recesses of the warriors wardrobe, to gaze at what we used to look like. And used to strive to look like. This robust armor was forged by dwarven master smiths deep in the bowels of Ironforge. 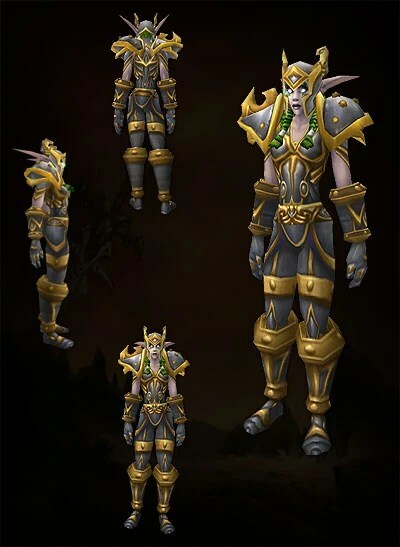 The armor was crafted from the finest metals as a token of thanks for the Alliance’s aid during the Second War and is worn by the Alliance’s most highly exalted champions. Articulated plates are form-fitted to the wearer, and affixed to tightly woven chainmail undergarments. Every piece is accented with gold etchings, studs, and flares. The first “tier” set I came into contact with was Valor. The “class raids” to Upper Blackrock Spire, the endless slogs to the Baron Rivendare…and not least, the countless visits to the Scholomance for the helm, each time struggling against the oldest of the Barovs. Numbers of visits at each of those places often ran well over 20 before the piece dropped, and each visit was near guaranteed to be accompanied by a “I dont think that he has more of piece X left in his wardrobe” from a disgruntled player with more runs under their belt than you. Whatever one might say about Valor, it looked the part. Silver and golden as it was, it was quite a sight to behold when somebody walked by in a full set. Statswise it used to hold its own before one entered the raids. Single pieces could be replaced for better stats, but on the whole, you weren’t in a completely wrong alley with Valor. Valor was replaced by the epics from Zul’Gurub and Molten Core, but it was not until Heroism was made available that the once so numerous silver and gold warriors disappeared. These days, hardly anybody bothers with it on their way to level 80, and rightfully so. It is no match for Outland gear, and it is too hard to acquire these days. Its glory days long over, it is still remembered by those whom it served faithfully. I think it was a mistake to not have a dungeon set in Wrath. I wasn’t around for Vanilla wow, but I did work to get some of the Bold items from level 70. I think having a dungeon set encourages people to gear up just a little more before jumping into content that they aren’t ready for. I never did complete it.